Known as the “champagne of teas”, Darjeeling tea is famed for its sparkling clarity of taste and crystalline sweetness, benefitting from the steady rainfall, light soil and cool air of the Himalayan foothills. Picked during the second harvest of the year between May and June, this “Second Flush” Darjeeling takes on some of the warmth of late spring, with developed fruit notes coming through in the cup. 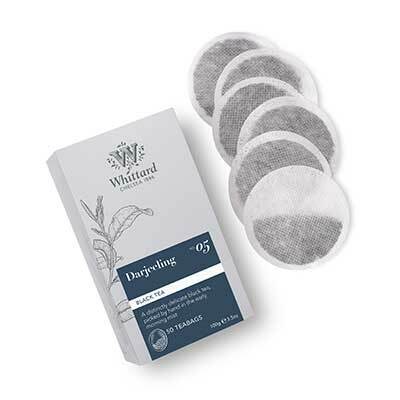 You'll often hear connoisseurs refer to the “muscatel” quality of a good Second Flush variety, and it's true that this particular Darjeeling tea has a real sense of that delicious dessert wine sweetness. Far lighter than most black teas, Darjeeling is best brewed lightly and enjoyed without milk – you'll find it's sublimely refreshing at any time of day. This is not for breakfast but for savouring later in the day. I drink it without milk and love its beautiful colour. A high-class tea!